Chaz Salazar appeared most recently on Show 208, recorded in January 2010, at age 17. He also appeared on Show 191. 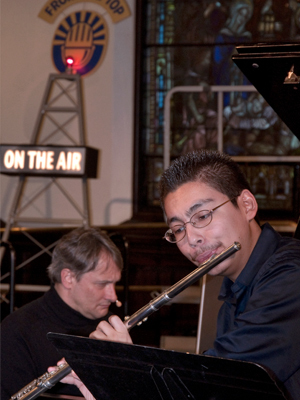 Chaz Salazar (Flute), 17, is a recipient of From the Top’s $10,000 Jack Kent Cooke Young Artist Award. A native of Phoenix, AZ, he is a senior at Cesar Chavez High School and studies music with Judy Conrad at Rosie’s House, a music academy that provides free private lessons to children of low-income families. Chaz is a member of the Phoenix Youth Symphony, where he is principal flute, the Arizona All-State Orchestra, several small ensembles, and his high school’s band and orchestra. Check out his hair, it stands straight up! Chaz is a Jack Kent Cooke Young Artist. Congratulations to Chaz Salazar – From the Top Jack Kent Cooke Young Artist!